Over the years, American chip brand Pringles has been treating its Japanese customers to a huge variety of exclusive local flavors, including specialties like sukiyaki. Now, Pringles is teaming up with Super Cup, a popular brand of noodles by Japanese company Acecook, to bring us Pringles-flavored ramen and ramen-flavored Pringles. The new collaboration marks Super Cup’s 30th anniversary and Pringles’ 50th, with four new limited-edition products. 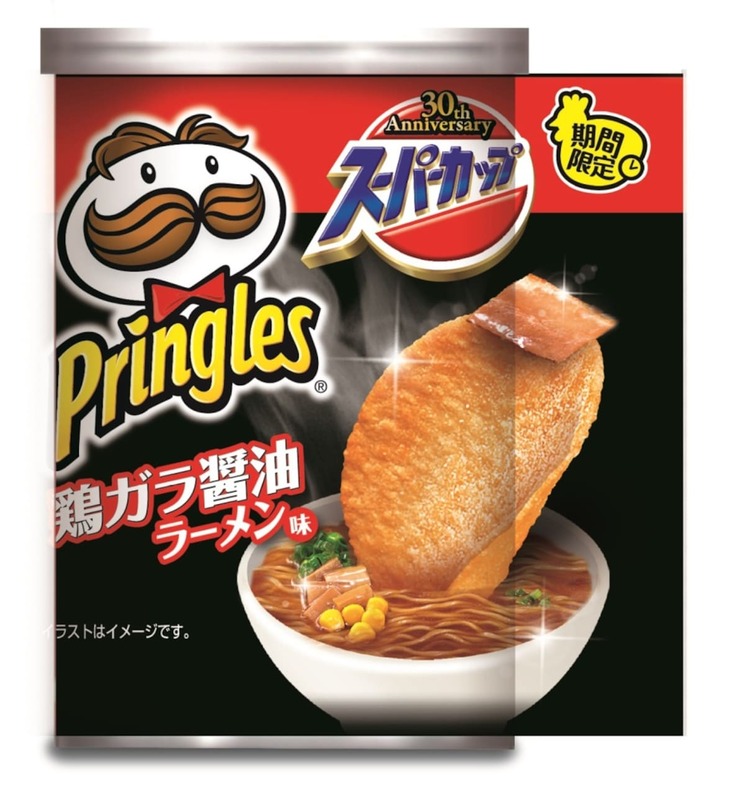 First up in the range is the Acecook Torigara Shoyu Ramen Pringles, which features the same torigara shoyu (chicken stock soy sauce) used in Super Cup’s instant noodles. Now all the rich, salty chicken flavor from this instant noodle variety is being used as the star ingredient for the new limited-edition Pringles. And the packaging is said to show a chip enjoying an onsen-style soak in a bowl of ramen broth with a piece of char siu pork on its head, like a towel. The other limited-edition Pringles flavor in the range is the Acecook Ika Yakisoba Aji, which translates to "Squid Fried Noodles Flavor." This one is said to contain a well-rounded balance of sweet, tart and umami flavors that seafood lovers will fall in love with. And on the pack there’s a cute chip eating steaming hot squid yakisoba with chopsticks. A lot of the flavor is said to come from the special seasoning used in Acecook’s regular Ika Yakisoba ramen noodles. And now we move on to the instant noodle range, starting with the Pringles Sour Cream and Onion Yakisoba. This large serving of noodles is said to contain the same addictive and well-rounded blend of onion, garlic, sour cream and cheese flavors as the chips. Plus, the same Sour Cream and Onion flavor is also included in an additional seasoning sachet to give you an extra boost of chip flavor on your noodles. Rounding off the collection is the Jalapeño and Onion cup noodles. Super Cup is known for generous portions (at 1.5 times larger than standard cup ramen), and the new Pringles variety is no exception. This one is said to contain a chicken broth base, garnished with potato and onion flavors, with the Pringles Jalapeño seasoning served in a separate spice packet so you can adjust the heat to your liking. 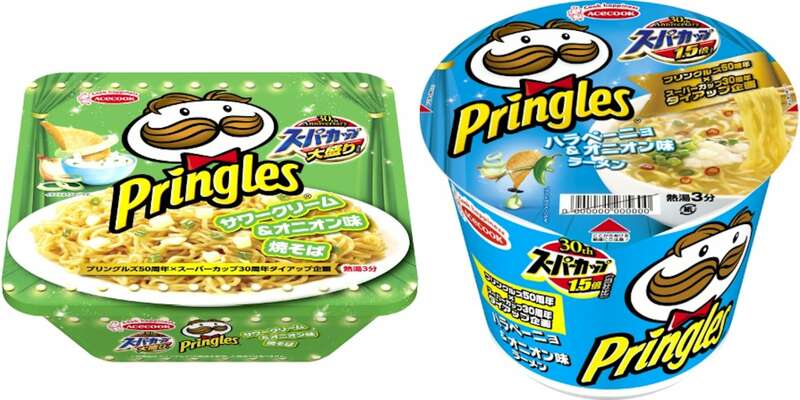 The new Pringles-flavored noodles are set to retail for ¥200 each at supermarkets and convenience stores around the country from October 15, 2018, while the new ramen-flavored Pringles will be available for ¥122 each from October 23, 2018.